I have been working for Upper Deck with our Customer Care group for more than five years and actually managed a card shop prior to that. As the Manager of UD’s Customer Care division, I find it exciting to be on the front lines, working with our customers and hearing first-hand what your experience is like with our brands. 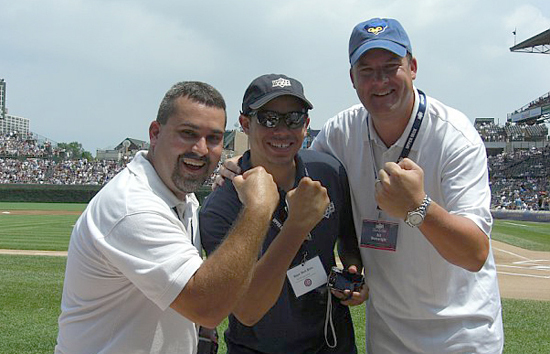 Nick Leslie (middle) poses with two UD collectors at Wrigley Field just prior to getting one of them to throw out the first pitch of the game. Throughout the course of our workday, we often hear the same questions over and over again. Usually when one person has a question, they are not alone. Knowing that, we wanted to create a recurring column on the UD Blog which will answer those questions we are getting asked the most. 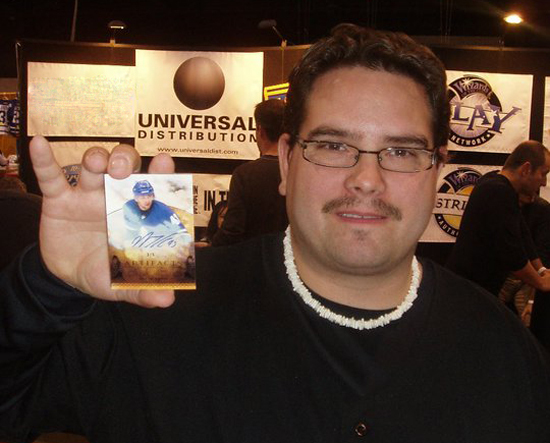 Ask Upper Deck: Why are there rookie exchange cards? Can’t you just put the cards in the product? Nick Leslie: “There is definitely a demand and interest in early season NHL trading card releases. Unfortunately the NHL has a rule that a manufacturer cannot produce a rookie card of a prospect until they actually skate in an official league game. This rule is a good one as it helps to make sure that the prospect is playing with the team so it is likely the player’s cards will have better value. “The problem is that rookies really drive hockey card sales and if our early season products didn’t have a way for collectors to get new rookies, those products would be considered much less collectible. And our mantra here is all about making the most collectible products in the industry. So we came up with the idea of draft pick exchange cards where collectors receive a card for a future rookie that we determine after the season starts. 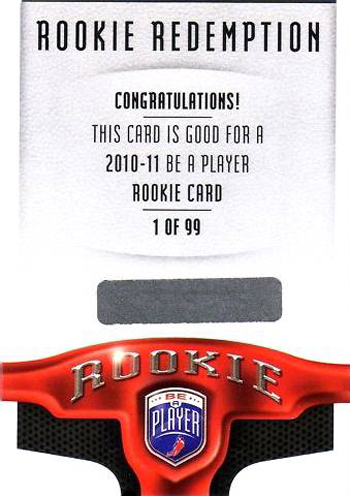 Adding draft pick redemptions to early season hockey products helps add value to those products. Ask Upper Deck: How can I find Upper Deck autograph cards of the top rookies like Taylor Hall, Tyler Seguin, P.K. Subban, Jeff Skinner and Jordan Eberle? Nick Leslie: “The rookie class for 2010-11 NHL cards has been very strong and puck fans have definitely been looking to get autographs of these star players. Upper Deck is very excited to bring them directly to fans in a variety of ways. This happy collector pulled a 2010-11 NHL Arifacts Autofacts card of Nazem Kadri. 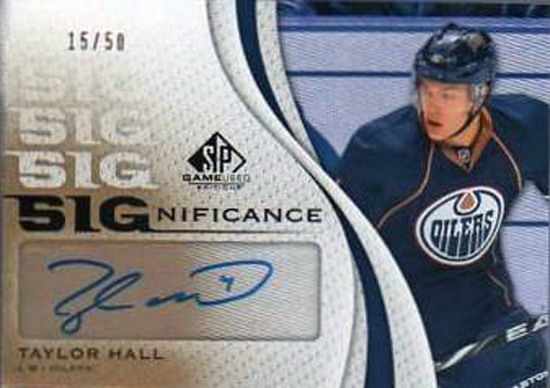 Taylor Hall 2010-11 NHL SP Game-Used Significance cards are live in the market! “As we reach the second half of the season there will be even more rookie autographs of these top talents in new Upper Deck sets so keep an eye out for them. There are some other places you can find rookie autographs from Upper Deck though. We produced Taylor Hall and Tyler Seguin autograph cards for the Priority Signings set and those were distributed at the NHL Fall Expo. 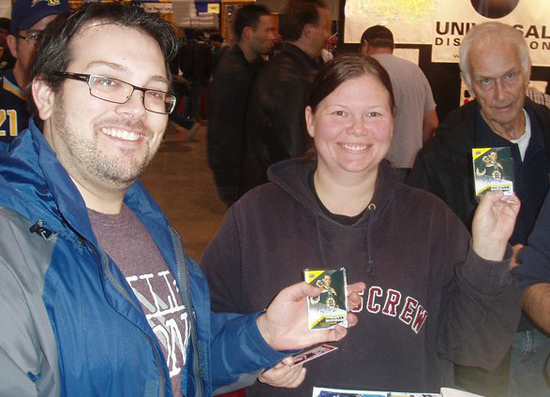 These lucky collectors both pulled Tyler Seguin autographed Priority Signings cards at the NHL Fall Expo in Toronto. Ask Upper Deck: When is SP Authentic Football coming out and why has there been delays? 2010 SP Authentic Football is coming February 15!